CNN's town hall political takedown of the Bill of Rights and the Second Amendment -- in response to the tragic murders at a Florida school -- has been wrongly described by some conservatives as an Orwellian Two Minutes Hate. So, those who called it CNN's Two Minutes Hate should publicly admit how wrong they were. Because it went on for much longer than two minutes, didn't it? It went on and on and on, and from the earliest moments it became clear that this wasn't a reasonable discussion about complicated policy and the Bill of Rights. This was all about confrontation, drama and exhorting a crowd that wants politicians to "do something" about guns. And so, the CNN many minutes of Second Amendment hate was nothing more than a campaign rally for the Democratic Party. Others might say otherwise, but it wouldn't be the first time others would be wrong. This was about stoking politics, anger, frustration and fear, and weaponizing it to help Democrats "do something" to the Constitution. A student likened Sen. Marco Rubio, the Florida Republican, to mass murder suspect Nikolas Cruz for accepting campaign donations from the National Rifle Association. The crowd jeered at Rubio. He looked like a trapped forest creature. And they loved it. And another star of the show was Broward County Sheriff Scott Israel, in full uniform. Israel is a politician, a Democrat who runs for election, and he received a roar from the crowd when he lashed out at NRA spokeswoman Dana Loesch. What bothered him was the NRA bringing up the aggravating fact that there had been repeated and well-documented failures of law enforcement -- from the FBI to the locals -- that could have stopped Cruz. "You just told this group of people that you're standing up for them," he said. "You are not standing up for them until you say, 'I want less weapons.'" "You will get this done," Sheriff Israel told them. "Vote in people who feel the same way you do." 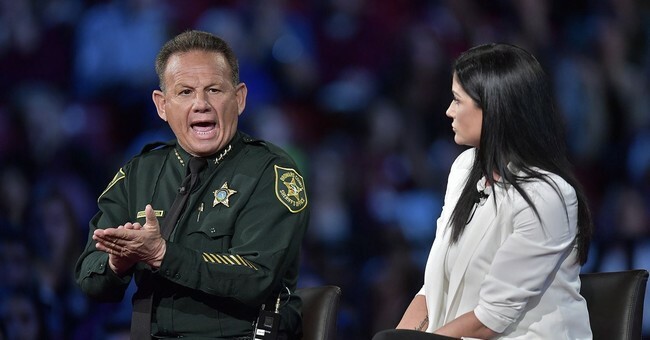 What the public didn't know at the time of Israel's speechifying was that on the day of the shooting, a Broward deputy sheriff was stationed at the school. When the shooting began, Israel's armed deputy hid outside in safety and remained there. But if the good sheriff -- a political cat -- had explained that business about his frightened deputy, he'd have ruined the show. So he kept his mouth shut. The CNN event was compelling TV. But raw emotion is always compelling on the screen. What TV can't handle is context, or complicated, layered arguments. And explaining how policy works its way through a republic, and how the system is designed to restrain passion, to diffuse it -- all that is death to TV. Irritated TV news executives would roll their eyes and sigh, and mouth the word "boring" if asked to spend equal time explaining to civics-deprived Americans how their republic was set up years ago. It was set up to restrain the passions of its people, and was made inefficient by design in order to protect individual liberty. Our system wasn't designed to "do something" quickly. But those who won't "do something" quickly with the Second Amendment are cast as agents of evil in all this. TV isn't about restraint. It's all about the immediate. It's all about passion, emotion, drama, anger, frustration and tears, because that is what TV does well, selling it all, triggering it all, tears especially, and selling some more. TV does this all exceedingly well with dramatic serial fiction, and through sports like the Winter Olympics, and that CNN event. The grief of the survivors is legitimate. What could be more legitimately emotional than a gathering of students and their parents after 17 people were shot down by a madman with an AR-15 rifle? If you weren't moved by the parents and the students and their fear and anger, then you don't have a heart. As a parent, I was certainly moved. And if you weren't, then I'm sorry for you. But the heart doesn't make policy. And speaking from the heart alone isn't the wisest thing to do when moving quickly to "do something" to the Bill of Rights. There are things that can be done, including hardening the soft targets of suburban schools and using state legislative measures, including temporary gun violence restraining orders to take guns away from threats like Nikolas Cruz. Yet even that takes time. As far as TV goes, CNN's many minutes of hate on the Second Amendment was dramatic. It pushed the right Democratic political buttons. But it will also echo throughout the red states, and Democratic officeholders in those states may face blowback at the polls. A day after the CNN event, an amazing thing happened. The news broke about how that armed deputy stationed at the school had failed to act, and later news sources suggested three other deputies at the school did not enter during the shooting. Sheriff Israel had to say something. "I'm devastated. Sick to my stomach. There are no words," he said of the deputy who avoided danger that day. "These families lost their children. We lost coaches. I've been to the funerals. ... It's just -- there are no words." No words, sir? No words? Of course not. Yet you had plenty of words at that CNN event, where you played the demagogue in front of a crowd of grieving Americans. The framers of the Constitution were worried about people just like you. It's why the Bill of Rights is there.